The first time I heard about the Arrowhead 135 was, I believe, in the Fall of 2009. 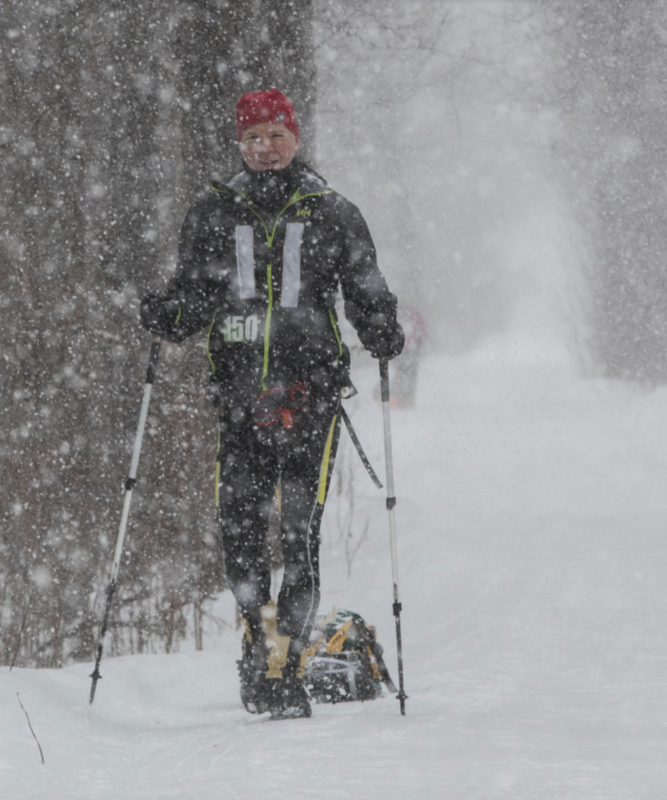 A gentleman who had participated in the event numerous times, Pat Susnik, had told me all about the race. “It’s how far?” I thought. “At what time of the year?” “In I-Falls?” I was simultaneously frightened and fascinated by it and deep down I knew someday I’d do that race. 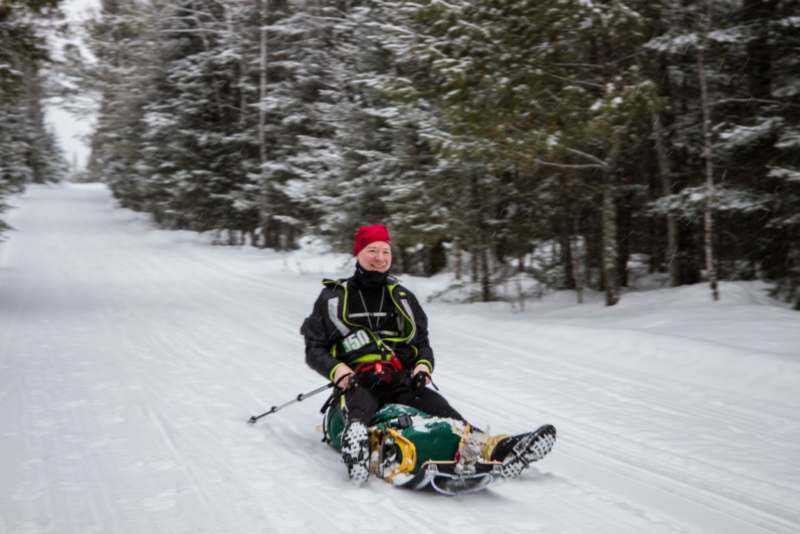 Fast forward to 2015 and I found myself riding my bike 150 miles at the Tuscobia Winter Ultra. I’m a lousy winter cyclist and finished dead last, but I finished. My main goal, however was to gain some winter experience and to qualify for Arrowhead but I can’t say I had fun. In fact, after the race I remarked to a co-worker, “I will never do Arrowhead. Never.” There was simply no way I wanted to ride my bike for that long, for that many hours ever again. Fast forward again to January 2016 and there I was, on my bike, on the starting line of Arrowhead! The race had been haunting me for so long I just couldn’t NOT give it a try. I felt a bit under trained for the race but I was still confident, and excited. After all of those years of having thought of the Arrowhead 135, I was finally there, on the course experiencing it all! I was thrilled. The race itself didn’t go so well for me. As I said, I’m a lousy winter cyclist and the warm temps that year created some really soft snow that I simply didn’t have the skills or the strength to ride very well. I was pushing my bike a lot and while doing some math in my head somewhere between the Gateway checkpoint and the Melgeorge checkpoint I knew that my best option was to drop out and come back next year. And I KNEW I was going to come back next year, because the race was just so incredible! The course, the people, the solitude on the trail…it was amazing. So in the Summer of 2016 I began training for Arrowhead in earnest. I had decided that I wanted to do Arrowhead on foot this time for a couple of reasons. One, being a runner I felt that this mode was a bit more in my wheelhouse. Second, I felt like doing the race on foot would really get to the heart of the true Arrowhead experience. I’d simply be out there on the course, in the elements longer. And I wanted that experience. I began training with a bit of normal running and that worked fine, but my best training was when I was dragging a tire. A friend had loaned me a nice old truck tire that weighed about 35 pounds. I attached a rope to it and strapped a harness around my waist and began my Summer of tire dragging. My main workout was a series of hill repeats up and down a ski hill at Chester Park. Up and down, over and over and over. Sometimes I’d wear a pack with about 10 pounds of weight in it as well. My goal was to build strength and power as that’s always a weakness for me in these long races. 15, 20, 30 times up that ski hill I went until the snow fell and I couldn’t be on the hill anymore. It was absolutely the right choice to do those hill repeats. It definitely made me stronger and it prepared me well for the hills at Arrowhead. The 2017 Arrowhead began with warm temps and a chance of up to 5 inches of snow. I started out the race pretty relaxed, just walking along at a nice 4mph pace. I walked quite a bit with John Bertram, whom I had just met that day. He was a race veteran and a good guy to chat with so I stuck with him. I didn’t run for the first 4 hours of the race, just kept walking at a decent clip and tried to be patient. Last year I had seen all of this first half of the course on the bike but it definitely took on a new perspective on foot. I had time to really take it all in, and notice the landscape, the quiet and the beauty of the route. There was a really nice light snowfall for a good part of that first section to Gateway and it was so much fun just to be out there. I was pumped to get to Gateway, not so much because I needed a break but because I had been waiting for a year to eat some of the great food they cook up for us there! I stuffed myself with some goulash, wild rice soup and a cherry Coke, tried to dry out some clothes as well as I could and I was out. Overall I would’ve liked to have been out of Gateway a bit sooner but I was pleased not to waste too much time. The section after Gateway starts to get hillier and this is also when you start moving in the dark as well. Last year on the bike I struggled a lot through here, mostly pushing my bike, so this year I was determined to stay positive with my thoughts, and keep pushing through. That positive mindset really helped as I tackled the hills and the darkness. That and a Red Bull. Red Bull is amazing! Another aspect of training that I had done was to stop drinking coffee. I slowly worked myself down over the course of a couple months and by December I was caffeine free. My thought was that if I were to get off caffeine that I could then use it at Arrowhead to have more effect to help me stay awake. That plan worked really well and it’s something I would do again for sure. Later into the night there was quite a sound off in the distance. “Wolves!” I thought. At first it sounded as if they had killed something or there was a tussle between a couple of them. By the sounds of it I guessed there were about 4 to 6 of them. Then, a few seconds later, the howling started. All of them in unison, howling in that classic tone. You could just picture their necks outstretched and their faces turned up to the sky. It was awesome! I got into Melgeorge feeling pretty decent. I was tired and ready for a break but overall I was feeling fine. I was a bit behind my goal time but I wasn’t too concerned, overall my finishing time was not a major focus for me, I just wanted to finish, take it all in and enjoy the race. I dilly dallied a bit too much at Melgeorge, certainly more than I had hoped. Even though it was crowded and loud, it just felt so good to be sitting in a nice comfortable chair and not move. Eventually I made my way upstairs and slept for about an hour before I realized that I needed to get up and get moving. Everyone said that this section was the hardest section by far and since I had dropped at Melgeorge the previous year, I was actually anxious to get going and see how tough it was. Well it turned out that the first third or so of that section is actually relatively flat! There were certainly a couple of steep hills in there but there were also a couple of long, flat sections that were relatively easy to move along on. And then the hills started! It just seemed like hill after hill after hill, up and down just like the hill repeats I had done at Chester. The beauty this time was that I could sled down them! Now that was fun! It was in this section that I hit my lowest point. I was pretty sure I wasn’t going to finish in time. I kept doing the math over and over in my head and every time I did I came up with a different answer and every answer I came up with told me I wasn’t going to make it! The fatigue had definitely caught up with my by this point. I kept telling myself to stay positive, to be here, in this moment and make the best of the present situation. Then John Bertram caught me at the top of a hill and I asked him if we were going to make it. He reassured me that we were and that made me feel a lot better. So John and I trudged on through the second night. Still more hills, over and over. I was getting tired and a bit cranky but I did my best to keep moving, just keep moving. Hallucinations started happening on this second night too. I was seeing people on the side of the trail on a pretty regular basis but the best (worst?) hallucination was one that I heard. 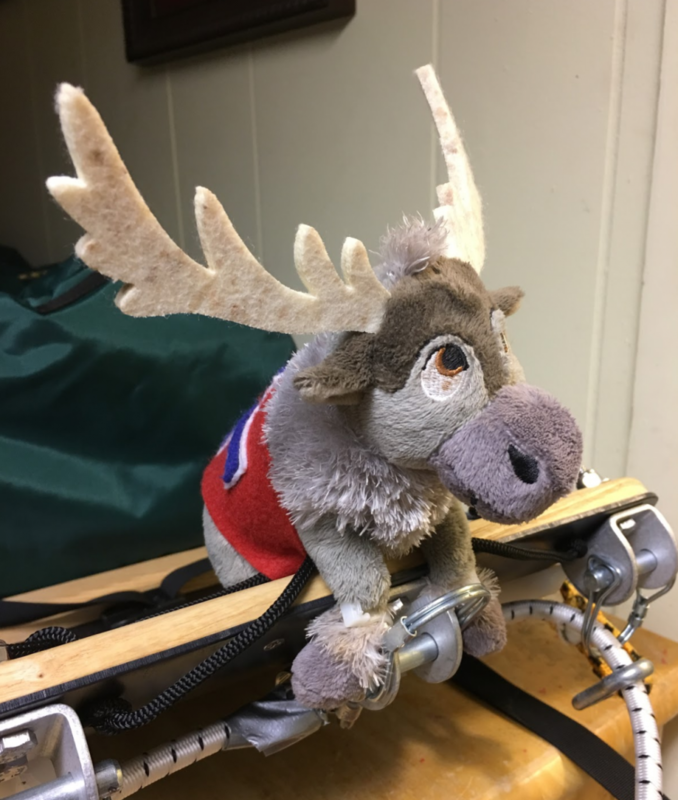 Sven, my trusty reindeer that accompanies me on these journeys spoke to me. Or so I thought. I pulled my sled up to me so that I could sit on the back before sledding down a hill and I said out loud, “Thanks Sven.” “You’re welcome”, Sven replied! I knew I needed sleep at that point! Eventually, a sign for the Surly checkpoint! It must be soon, we’re almost there! My plan was to bivy for a bit at Surly. I didn’t want to bivy and waste that time but I desperately needed to sleep, there was no way I was going to be able to push on to the finish without some sleep. So on to Surly. And then still, on to Surly. And then still…on to Surly. “Where the hell is this damn checkpoint? !” Finally, three miles or so after seeing the first sign for the Surly checkpoint, we came upon the famous tee pee that is the Surly checkpoint. I checked in, got my bivy out and slept for an hour. That felt great, I was refreshed and ready to go. I got a bit of Coke and some coffee in the tee pee and I was off, determined to push the final 26 miles or so to the finish. However, there was still one more obstacle that I would have to overcome and this one was totally due to an error on my part. In the night, while I was sleeping in my bivy, I had left my pack and hydration bladder outside and as it turned out, the hose froze up as the temps dropped that evening. I wasn’t aware of this as I left the aid station but it wasn’t long until I discovered what happened. I tried running the hose in my sleeve, under my arm, everything I could think of but I couldn’t get it to thaw out. Finally, I came up with a plan. Every hour I would take my jacket off, then take my pack off, then take the hydration bladder out of the pack, open up the bladder and drink straight out of it. That worked, for a while, but I got pretty tired of doing that every hour so after about 4 hours of that I decided that I had had enough water for the rest of the way, I’d just plug along without it. The last section after Wakemup Hill is flat, much of it is swampland. It was a beautiful day out there, blue skies, white snow and a tail wind. Early that morning, as the sun was slowly rising in the east there was a very brief time when there was this subtle orange glow all around. The sky, the snow, the air around me was this very soft orange color. It lasted only seconds but I will never forget that color. Normally I’m a pretty slow walker but I was actually moving along well as I continued to walk along that final stretch, just enjoying it all and pleased that I was going to be finishing Arrowhead. Then, as I made my way into the area of Fortune Bay Casino, where the race finishes, I came upon turn after turn in the trail. Each time I was expecting to see the finish line around the bend and each time I was rejected! It was so frustrating. This was a bit like waiting to come up to the Surly checkpoint all over again! Again, I told myself to just be in the moment, stay positive and the finish would arrive soon. And sure enough, 55 hours after I started in I-Falls, there was the finish line. I had made it! I was so pleased to finally be done, to have finished this great race. Arrowhead is a race/event unlike any I’ve ever done and to be honest, it’s difficult to accurately talk about. Words alone cannot do it justice. I tell people that I’ve only taken part in two races that I’ve felt honored to be at; the Boston Marathon and the Arrowhead 135. There’s something special about that race that’s difficult to put a finger on. The course is beautiful, the distance is a challenge, the people are inspiring and the woods are peaceful. I can’t wait to go back next year!